One thing I learned from my 200-hour yoga teacher training course is that the way an instructor understands and internalizes yoga is the way the instructor should teach yoga. Aside from an exception here-and-there (Bikram yoga comes to mind), there is no formula for how yoga should be taught. As students learning to teach yoga, we should therefore embrace what makes sense and feels right to us and leave the rest behind. I was exposed to a broad array of yogic knowledge in my month-long class. A lot of that knowledge I will take with me; some I will leave behind. us grounded while the arches of the feet lift us up. 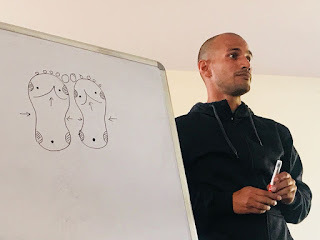 There are a few reasons I decided to do my teacher training in India. For one, India is well-regarded as the birthplace of yoga. The history of yoga in the United States, as is true for most things in the country, is relatively young. Plus, the yoga of the western world has been heavily modified to conform with western mentalities. I wanted to study yoga closer to its source, to better understand the essence of yoga. The truth of the matter is that yoga is more holistic than just poses. Yoga, after all, means union -- union of the body, mind, and spirit. 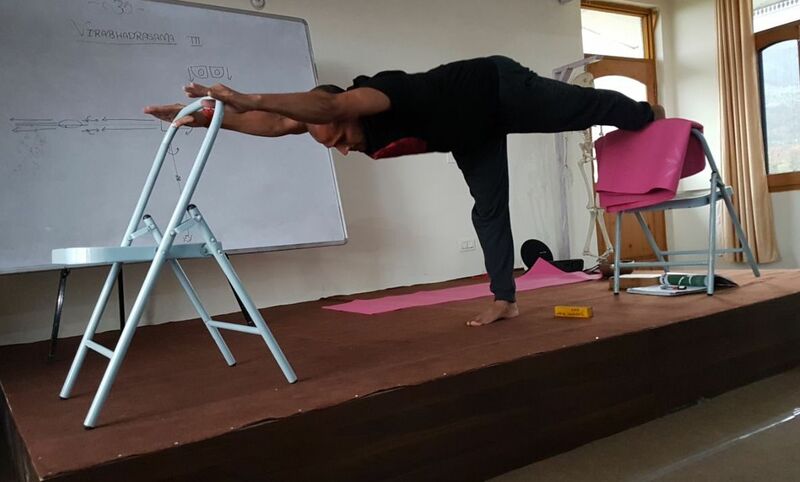 I can hear the sweet voice of Dr. Amrita, one of our instructors, saying, "Yoga is a personality development system." As explained in Kriya: Going Above & Beyond Downward Dog, yoga is the science of well-being that influences all aspects of life: physical, mental, emotional, psychological, and spiritual. In addition to its asanas (or poses), yoga also includes methods for meditation, breathing, self-purification, and a handful of other components that ultimately lead to enlightenment. 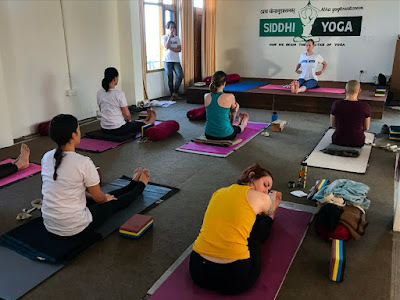 Below are some reflections on my learnings from my Siddhi Yoga course. Yoga is a metaphor for life. There are so many wonderful things it can teach us. For example, if we are not in a mental space to go into a pose, we won't go into that pose. We need to want to achieve a pose. It's just like what Henry Ford said: "Whether you think you can or you can't, you're right." Likewise, if we hold fear in a particular part of our bodies, we won't be able to achieve a pose. It's just like what Jack Canfield said: "Everything you want is on the other side of fear." And, just like with life, we're going to get a lot further if we bring a can-do attitude to our mats everyday. 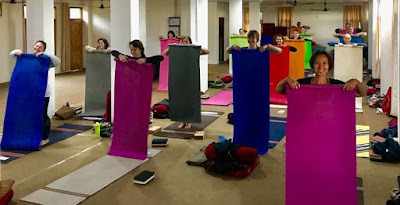 There were occasionally times during the course when I was not in the mood for yet-another-round of sun salutations. But I did my best to bring a can-do attitude to each and every class. In the end, I was always grateful that I did. Addressing the predominantly western-based student attendance, Dr. Amrita made some profound remarks. She said that we concern ourselves with the calories of the foods we put in our bodies, but rarely do we concern ourselves with the calories of the thoughts we put in our heads. Likewise, we have a plethora of remedies to improve the beauty of our appearances, but we have few remedies to improve the beauty of our souls. How so very true! Dr. Amrita also discussed the difference between a smile on ours faces and a smile in our hearts. A smile on our face easily comes-and-goes; a smile in our hearts radiates further and shines longer. One of my favorite quotes from Dr. Amrita's class was: "When you become enlightened, you shine like the sun and absorb like the black hole." Absolutely beautiful! Most illnesses in the western world are psychosomatic. In other words, they are illnesses caused or aggravated by mental factors, such as stress. Though we are capable of creating these illnesses, rarely do we know how to cure them. Yoga is often the best vaccination against stress, thereby helping to keep psychosomatic illnesses at bay. Asanas are the poses, or postures, of yoga. Appropriate alignment is critical to performing a proper asana. Though a person may be flexible, if the alignment for an asana is improper, then the asana is self-defeating. Think of a seated forward bend, in which an individual is seated on the ground, with both legs together and extended frontwards. A flexible person can easily touch his or her toes. However, the most important part of a seated forward bend is keeping a straight back and rotating from the hips. The ability to flex the back and touch the toes is secondary. As such, it is far better to rotate from the hips with a straight back and only touch your calf versus touching your toes with an arched back. on how to properly do a seated forward bend. We spent hours learning about various poses and anatomizing the nitty-gritty of the proper alignments. 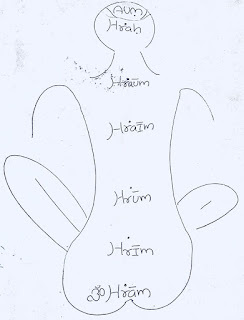 For each of the poses, we drew a simple stick figure and used markings to indicate how the body should be aligned in that position. We also talked, in depth, about the challenges and contraindications for each pose. 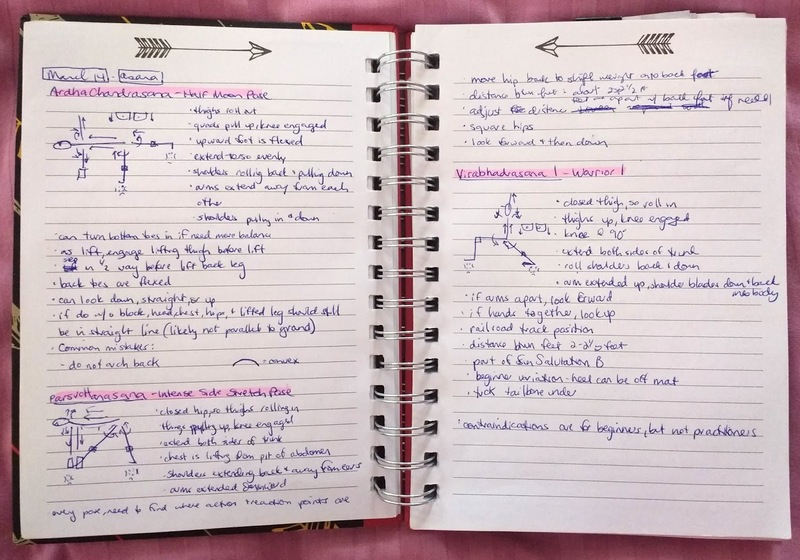 My notebook is filled with diagrams and notes on asanas and alignments. My notebook of asana diagrams and alignments. Let's look at tadasana, or "mountain pose," as an example. Tadasana is the foundation for establishing correct alignment in nearly all other poses. Though tadasana is a simple pose, there is a lot going on with this asana. Feet: Together. Ground four mounds down, and lift three arches. Torso: Extend both sides away from waist. Shoulders: Roll back and away from ears. Chin: Make parallel with floor. Head: Point crown towards ceiling. 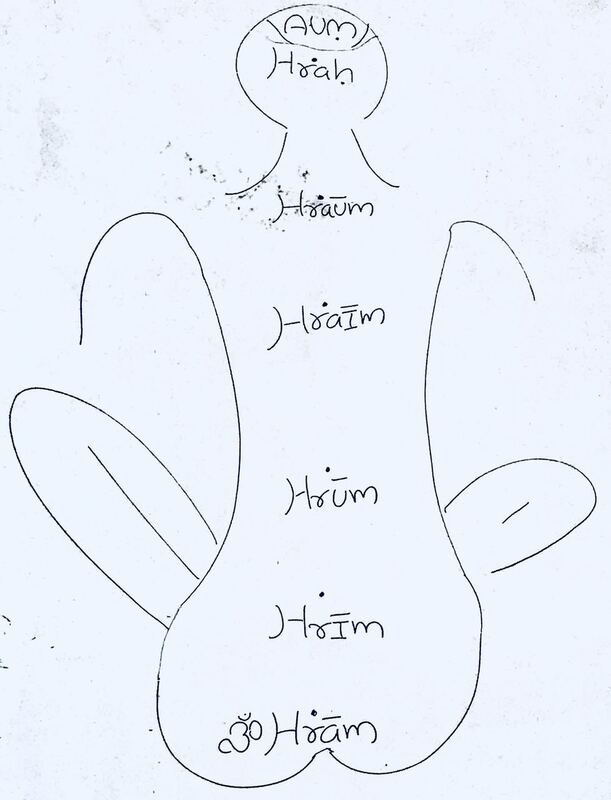 We spent quite a bit of time dissecting the nuiansaces of tadasana. Unfortunately, this pose has been further complicated by two aspects of our modern society -- sitting in chairs and sleeping in beds. Chairs and beds have wrecked havoc on our bodies! As such, we critiqued each and every one of our bodies to see what was and was not in alignment. For me, I learned that I have a wee bit of knock-knees, meaning that my knee caps point towards each other rather than forward. To adjust for this, I need to stand with my feet a few inches apart (rather than together) and roll the tops of my thighs outwards (rather than inwards). Though not directly relevant to tadasana, I also learned that I have hyperextended elbows, primarily due to weak arm muscles. To adjust for this hyperextension, I need to put a slight microbend in any positions that are weight-bearing on my arms. If I didn't learn anything else in the 200-hour yoga course, I would have been entirely grateful simply learning how to stand properly in tadasana. Having learned about how to stand properly and the alignment nuisances of my body, I'm now hyper-aware of how I stand. No more valley girl, hip-jutting-out-to-the-side for this yogi! Plus, proper posture makes me taller and eliminates my slouch and belly bump. Tadasana should be a requirement in every kindergarten curriculum! In addition to learning alignments for numerous asanas, we also learned how to teach beginners, how to adjust students, and how to modify poses using props, such as chairs, straps, blocks, bolsters, and even people. Tara demonstrates how props can be used to assist with Warrior III. Even another person can be used as a prop for Warrior III! One other comment on alignments: I always assumed that my yoga teachers were performing each asana precisely and that I should mirror their exact positioning. It had never before dawned on me that a practitioner is often modifying positions in accordance with her or her own unique body. If students were to mimic me, for example, they would assume that they, too, should stand in tadasana with their feet slightly spread. It is important that a teacher explain the subtle nuisances of each pose; for someone whose toes, knees, and hips are properly aligned, feet should be together in tadasana. Meditation is not new to me. I've practiced meditation on-and-off for years. Our days at Siddhi Yoga began with a 45-minute meditation class. Many of the meditations were borrowed from Osho, an Indian guru, mystic, and spiritual teacher. Osho has a number of multi-stage meditations that begin with various types of physical movement and end with stillness and silence. The active stages of the meditations included movements such as shaking the body, dancing, jumping up and down with arms raised in the sky shouting "hoo," and even one stage where anything goes -- shouting, crying, screaming, laughing. Though I gave a solid girl-scout effort to these active mediations, they were not for me. I prefer more passive meditations -- with music, without music, guided, unguided. It need not matter. For me, meditation is most valuable when my body is still so I can fully exist in my mind. One thing I appreciated with respect to my meditation learnings was the analogy of our minds to the ocean. The top level of the ocean is rough with waves. If you go a bit deeper into the water, there is still turbulence, but the water is not as rough. If, however, you dive WAY deep into the water, it's calm and peaceful. When most of us meditate, we either sit at the surface level of the water or linger just below the surface. In order to experience the true benefits and bliss of meditation, we need to dive deeper into our minds, where there is calm and peace. We began and ended each of our classes with a combination of chants, Oms, and shantis (meaning "peace"). These chants, all in Sanskrit, while beautiful, meant little to me. I, personally, have a hard time chanting something for the mere purpose of chanting -- whether to honor tradition or otherwise. If I'm going to chant something, I want for it to be in a language that I understand. to each of the body's chakras. With that being said, I did appreciate learning more about the simple sound of Om. 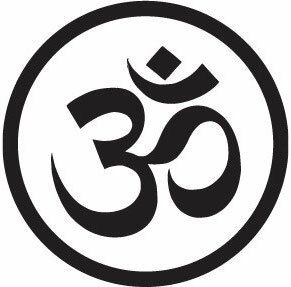 Om represents the constantly vibrating sound of the universe. Though I had always assumed that Om was one vowel, it actually consists of three separate sounds: a, u, and m. The a represents creation, the u represents preservation, and the m represents destruction. Coolio! I also gained appreciation for the feeling of vibrations. In the past, when I had brought my hands together in prayer, I had never focused on placing my thumbs against my heart center. However, pressing my thumbs against my chest enabled me to physically feel the immensely soothing reverberations of the Om sound. It reminded me of the vibrations you feel when you sit with a cello between your knees and draw the bow across the strings. After singing our Oms and shantis, we remained with our hands in prayer pose against our chests. The teacher instructed us to: "Take a deep breath in, take a deep breath out, bow your head, bring a nice smile on your face, open your eyes, and raise your head." The very simple gesture of putting a smile on my face filled me with a warm'n'content feeling. Every single time. After bowing to the instructor and saying namaste (meaning "the divine in me bows to the divine in you"), we then bowed to our surrounding classmates and said namaste. This is a practice I loved and will definitely carry with me. Pranayamas are breathing exercises. I was familiar with and had practiced nadi shodhana before the course. This is a method in which you close one or both nostrils while performing a rhythmic inhale, exhale, or retention of the breath for various lengths of time. We learned other active and inactive breathing methods -- some which I enjoyed, others which I didn't. For me, the big take-away with respect to pranayamas was that our breath tells us so much about ourselves. Like Tara, one of our instructors, said, "Once you know your breath, you don't need to read any more books to learn about yourself." Many of us (me!) are disconnected with certain parts of our body. As a cyclist and runner, I have a decent kinesthetic awareness of my legs and how they move within space. My toes, on the other hand, have always been simple, lifeless accoutrements to my feet. is a great way to strengthen the wrists. The course focused on two types of yoga -- hatha and vinyasa. Hatha yoga is all about poses and breathing. Vinyasa, also called "flow yoga," is about performing a sequence of poses, in accordance with the breath, but in a fast progression. I learned from the course that I'm not a fan of vinyasa yoga. While vinyasa is a more aerobic form of yoga, I don't look to yoga poses for aerobics -- I have cycling and running for that. Rather, I look to asanas as a means of stretching and relaxation. In my vinyasa classes, I felt like the emphasis was on quantity over quality. I don't know how many times I came frighteningly close to accidentally tweaking a muscle or overextending a body part. I don't need to risk injury in yoga. Vinyasa is not my thing. We had one restorative yoga class. This was my first foray into restorative yoga, and I absolutely loved it! Restorative yoga emphasizes the use of props and holding asanas for an extended period of time to allow the body to melt into the poses. Restorative yoga is about allowing the body to succumb to gravity, whereas other forms of yoga work the body against gravity. As I appreciate asanas as a form of stretching and relaxation, restorative yoga makes sense to me. I look forward to further exploring this form of yoga. I signed up for this class primarily with the intention of deepening my knowledge of yoga. Though I had inklings of maybe teaching yoga, particularly in conjunction with the bike trips I lead, I left the class enthused to teach. Teaching comes naturally to me -- I taught in grad school and later in community colleges. So why not extend that teaching to yoga? In my yoga teaching practicum, my instructor's only advice was to keep teaching. I see that as a good sign. We'll see how things pan out with time! During one of the class warm-ups, Tara threw us for a loop. He said that we had one minute to run around the room and touch the backsides of as many of our classmates' ankles as possible. After that, there was another round. We had one minute to touch the backsides of as many of our classmates' knees as possible. And yet another round. This time we had one minute to slap as many of our classmates' asses as possible! For this final round, we had a brief few seconds to exchange raised-eyebrows with one another, and then the timer began. There was so much laughter and giggling in those three minutes -- especially in the final round. I'm not entirely sure of the purpose of this warm-up, but it's not really important. What is important is that we incorporated play into yoga. There is a pose called savasana (pronounced sha-va-sa-na), or "corpse pose." It’s typically the final pose at the end of a yoga practice. You lie on the ground, on your back. You spread your legs a bit wider than hip distance and let your feet fall to the sides. You place your hands at the side of your hips, palms up. And you relax, closing your eyes and letting your body sink into the ground. It’s a way of restoring the body after its hard work from the yoga practice. The vinyasa flow class was rough not only for me, but also for a lot of my fellow students. It was made more difficult by the fact that it was the last class of the day. About one-third of the way through the first few classes, we'd ask Prem, "Is it time for savasana?" to which Prem would reply, "Not savasana yet." As the classes wore on, Prem would voluntarily remind numerous times in each vinyasa class, "Not savasana yet." At the end of the course, classmate Brigid surprised us all with printed t-shirts. 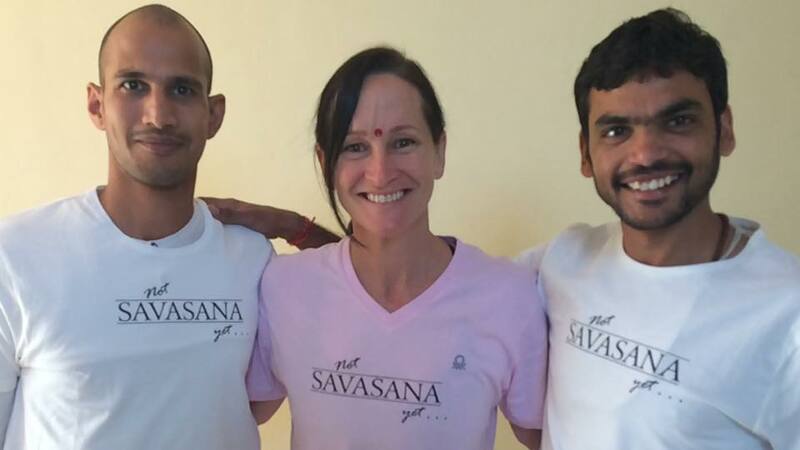 The front of the t-shirts read, "Not savasana yet." The back of the shirts read, "Prepare yourself for savasana." We couldn't wait to hear Prem say the phrase on the back of the shirts! Tara, Brigid, and Prem model the popular "not savasana yet" t-shirts. Suffice it to say, that I learned a lot from my month-long yoga teacher training course. Now, bring your hands together at your heart center. Take a deep breath in. Take a deep breath out. Bow your head. Bring a nice smile on your face. Open your eyes. And raise your heads. Namaste, friends. Wow... I love the idea of you reaching yoga, anywhere but for sure on guided bike trips. Your students will love it! You succeeded in dashing any stereotype I had about a yogi from India. Slapping butts, with the giggles that ensued would almost make me try it again. The biggest resonantion thought, and what will make you an outstanding teacher, is now you know the perfect pose is different for everyone. That sounds like it both makes the class better and harder to teach. I would be tempted to sign up! Love all of this, Sarah! I'm so glad to hear you feel inspired to teach and learned so much. I couldn't agree more that teaching what resonates in our personal practice is important. It helps to keep us authentic, which is so vital. One question I have for you - can you explain that vinyasa equation to me?? F4 = the First 4 poses of Surya Namasakar. C3 = the Center 3 poses of Surya Namaskar. P1(2,3)R = Variation Pose 1 (2, 3), on the Right side. 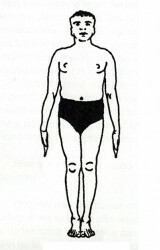 P1(2,3)L = Variation Pose 1 (2, 3), on the Left side. L4 = the Last 4 poses of Surya Namaskar.